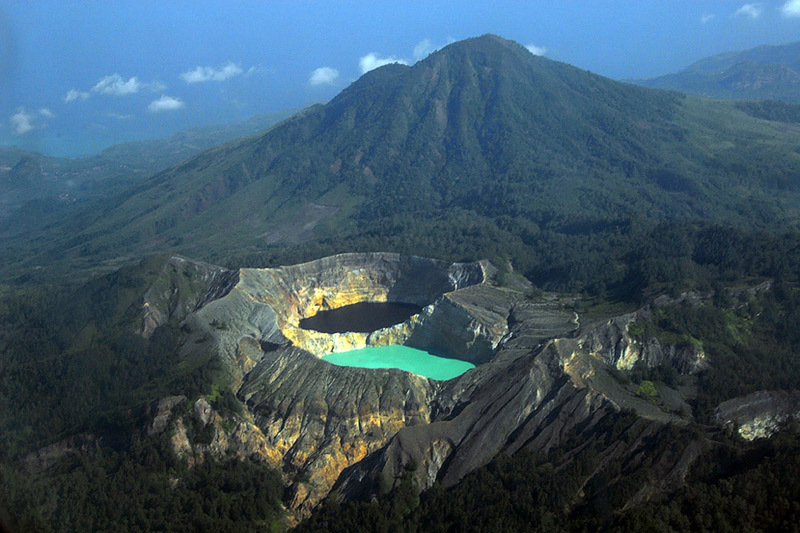 Kelimutu is a volcano mountain that located in in Pemo village, Kelimutu Sub-district, Ende regency, Flores Island. The volcano is around 50 km to the east of Ende. Kelimutu area has established as National Natural Conservation Area since February 26, 1992. Kelimutu is one of the mountains listed as a ribu in Indonesia which are mountains in Indonesia with more than 1,000 meters high. The area is said to have begun to attract attention after being noticed by a regional Dutch military commander, B. van Suchtelen in 1915 and became more well-known after Y. Bouman wrote about the site in 1929. The volcano contains three striking summit crater lakes of varying colors. The blue lake or Tiwu Nuwa Muri Koo Fai, is the place of young people soul who have died; The red lake or Tiwu Ata Polo, is a gathering place for the dead who had done evil or doing witchcraft during their previous life; The white lake or Tiwu Ata Mbupu is a gathering place for the elder soul who have died.